The retail package of the Sony Xperia T3 covers just the basics. There's an A/C adapter, a microUSB cable and the headset. The Sony Xperia T3 measures 150.7 x 77 x 7mm - that's 15mm shorter, 7mm narrower and a tad slimmer than the Xperia T2 Ultra phablet and very close to the Xperia Z2 flagship. The Sony Xperia T3 weighs 148g, reasonable for a solid midranger of such caliber and 15g lighter than the all-glass Xperia Z2. It's not like we haven't seen the OmniBalance design used on a plethora of Xperia smartphones over the past few years. It's probably time the next flagship moved on but the midrange Xperia T3 is on the safe side. It looks reasonably good and has pleasant handling. 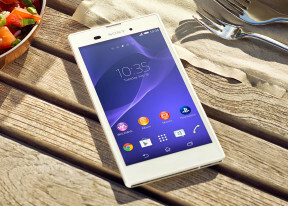 The Sony Xperia T3's entire front is occupied by the 5.3" IPS display. The non-removable rear cover is made of plastic, with matte finish in graphite black. The material doesn't look or feel low quality, but fingerprints tend to stick on. They would probably be harder to notice on the white and purple versions. Still, the issue is not as obvious as it would have been on a glossy surface. Just like most of the previous Xperia phones, the Xperia T3 sides are lined with a glossy strip for a nice contrasting accent. The only thing actually made of metal is the signature power/lock key. Handling the Sony Xperia T3 is a pleasure and the screen size isn't a particular burden. With a 7mm waistline, the Xperia T3 feels great in hand, not bulky at all, and well put together, no wobbles or squeaks. In fact, it's among the thinnest Sony phones ever. The Sony Xperia T3 flaunts a 5.3" IPS Triluminos display of 720p resolution, which works out to 277ppi. While this is nowhere near the 400+ pixel density of current flagships, it's a completely different price range we're talking about. 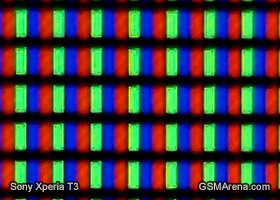 The Xperia T3 display is enhanced by Sony's Mobile BRAVIA 2 and X-Reality engine. The combo aims to improve sharpness, reduce noise, while boosting contrast and saturation, and it does a pretty good job of it. The pixel arrangement is standard RGB with an equal amount of green, red and blue pixels in line. The screen's contrast and brightness are very good, and so is color reproduction, all adding up to excellent image quality. The viewing angles, thanks to the IPS matrix, are better than average. There is no contrast and color washing when you look the screen at an angle, though there is a noticeable color shift from some directions. Unfortunately, even with Auto Brightness off, the ambient light sensor kept on intervening and we couldn't run our test at 50%. Using the Sony Xperia T3 in bright outdoor conditions turned out quite a trouble-free experience. The smartphone even managed to slightly outdo the HTC One (M8) in our test.